Big Screen Fishfinder with 320x320 pixels! Step up to big screen performance fishfinding with the Fishfinder 535. Loaded with a larger, very high resolution 5" 320V x 320H LCD with UltraBlack™ contrast enhancement and new Clear Edge Inverse Grayscale, the 535 delivers crisp, high definition images of fish and structure. Accelerated Real Time Sonar captures the action at up to 40 times per second for better images. Plus, our exclusive tilting & swiveling Quick Disconnect mounting system makes it easy to get on the water, and the X-Press™ Menus keeps it simple all day long so you more spend time fishing, not punching buttons! And because it’s built by Humminbird, the Fishfinder 535 is backed by over 30 years of quality fishfinding technology. Fully Gasketed, Waterproof Design and It Floats! 2 ½" Target Separation Reveals More with Greater Detail. 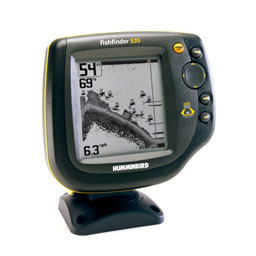 To order the Humminbird Fishfinder 535, add to cart.